15-year-old violinist Isabella Perron is on a roll. She participated in three international competitions this spring and summer and came away with three prizes. Most recently Isabella won the 11-14 Years Grand Prize at the Canadian Music Competition held in Vancouver from June 19-July 3. She received top marks of 97 percent and had the opportunity to perform with the Vancouver Metropolitan Symphony in a Gala Concert on July 4. She just returned to MRU to participate in the Conservatory’s Morningside Music Bridge, where she looks forward to studying with distinguished guest faculty including Noah Bendix-Balgley, Tadeusz Gadzina, Ian Swensen, Gwen Hoebig and Shanshan Yao. 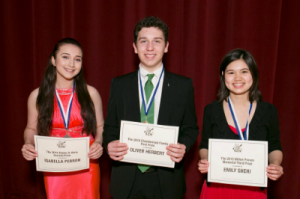 Isabella was the youngest semi-finalist in the 30th annual Irving M. Klein International String Competition held in San Francisco from June 4-7. She won the 2015 Elaine M. Klein Second Prize as well as the prize for Best Performance of a Commissioned Work. The first competition this year was the Johansen International Competition for Young String Players in Washington DC in March, where she reached the semi-finals. She had just turned 15. Isabella plays a Jean-Baptiste Vuillaume violin 1850 with a Apocyphe de Joseph Guarnerius Cremonae 1737 label and a bow from Nicolas Maline, lent by the company Canimex Inc. of Drummondville, Québec, Canada. 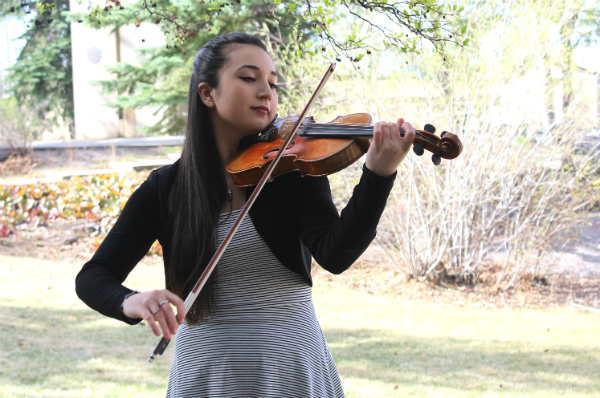 Isabella has been a student in the Conservatory’s Academy for Gifted Youth for four years, travelling to Calgary from Montreal for lessons once a month for the first three years. 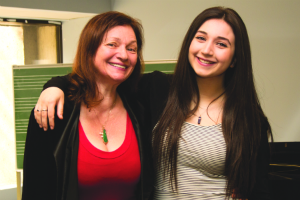 Isabella starts high school in the fall and plans to finish in two years so she can continue her undergraduate music studies in the US followed by her master’s in Europe. One of Isabella’s biggest fans is her mother Johanne, who teaches in the Conservatory’s Early Childhood Strings program. Along with her classical studies, Isabella plans to pursue her singing and songwriting interests with MRU’s new Songwriting course, part of the Conservatory’s new Popular Music offerings. Isabella has recorded a CD and will do a concert tour starting in August. Listen to Isabella Perron on SoundCloud.